The Gulf is blessed with beautiful beaches and ‘Shamals’ (winds blow from the northwest). Flinch from Gulf’s top, these shamals make their way down from Qatar to Dubai. When blown on shore, they produce tremendous surfable waves and allow locals, tourist and visitors to revel them almost after every ten days. These northwesterly blown winds have amplified the water sports activities in Dubai such as surfing, skateboarding, standup paddle boarding and kite boarding. Hence, when visiting Dubai, you are highly recommended to must surf around these shamals, as this could be one of your most exciting experiences. Surfing, skateboarding and standup paddle boarding are among the most acclaimed activities for the tourists and visitors to Dubai. Sunset beach, Kite beach and Jumeirah beach are the most well-known surfing spots in Dubai. 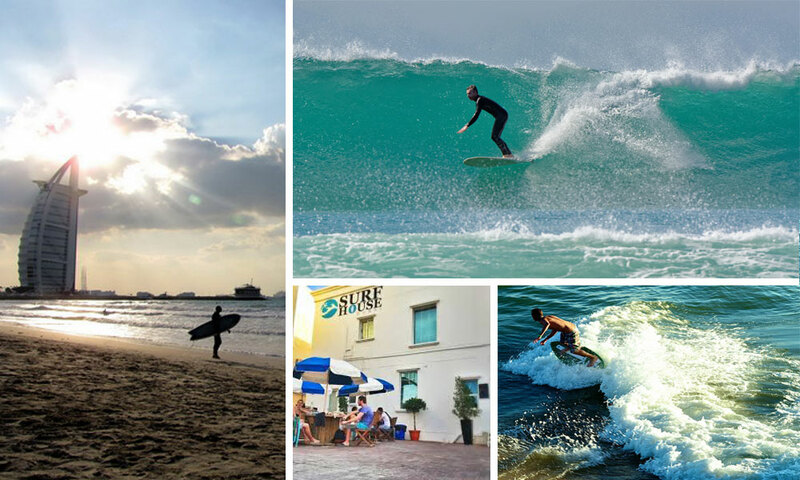 However, there are many other spots such as Ajman beaches, Sherries and Mamzar Beach Park that also offers some surf. If you are visiting Dubai between November & June, then you must add these free things to do in Dubai in your adventure list. However, you need to have all the necessary accessories for surfing such as skate broad, surfboard, surf-suits etc. You can easily find this stuff; if you are acquainted with some famous surf shops in Dubai. Below mentioned are the most venerated surf shops in Dubai that visitors and tourist usually prefer to buy their surfing accessories. Surf House Dubai is one of the most famous surf stores that can offer you rentals, repairs and the Surfaris. Surf House carries an extensive range of brands dealing with surfing, skateboarding, standup paddle boarding (SUP), clothing, etc. At Surf House Dubai you may also find music room, coffee and much more. This place also facilitates you to improve your flexibility by taking yoga classes here, as yoga goes side by side with standup paddle boarding and surfing. Surf House also entertains you with a talented music community that makes you revel your doings with live acoustic music and indoor music sessions too. Additionally, if you have already purchased your surf board and it is damaged somehow, then you can take it to ‘Dr. Ding’ at Surf House who can repair it at the lowest in 48 hours. Surf House Dubai is located at Umm Suqeim 2 and you may also dial 050-504-3020 for further queries related to their product or any service. DuKite is one of the finest place for those who want to learn and enjoy all the bits of surfing, kite boarding, skate boarding and SUP. DuKite is a full-fledged surf, skate and kite shop and school. DuKite shop located on Umm Suqeim 3 fishing harbor, presents you an inclusive brand variety of clothing, boards and accessories associated with surfing. However the DuKite School is located at Jumeirah beach road-Umm Suqeim 1, offers you the best training sessions, learning and surfing courses that help you excel in these water sporting activities. Surf Shop Arabia is one of the premium community hub for people who enjoy high-stroke lifestyles. If you plan to surf in Dubai, you should must check out Surf Shop Arabia; as here you can find the finest Surf, SUP and Skate stuff and accouterments. Located on Al Manara Road East, Interchange 3-Dubai; Surf Shop Arabia has the best variety of apparel and accessories at the most affordable price. Circle 8 is the rocking place for surfing Shopaholics. You can find one of the most assorted variety of brands related to snowboarding, surfing, skating, apparels, bag packs, accessories and much more. Circle 8 also offers free delivery across Dubai. It deals in the finest variety of surfboards and surfing accessories; and also offer sales and promotion frequently to offer you the best surfing deals. At Kitesurf Dubai, you can find the widest product range that is comprised of all kinds of water, land and trainer kites, control systems, surf boards, hydrofoils, harness, SUP boards and all other types of related accessories such as glasses, helmets, clothing, watches etc. Kitesurf Dubai also offer you repairing services and learning session for surf boarding and kite flying. If you are lucky enough to get it in-stock; then you can avail their seasonal sale; which may offer you to shop the best surfing bundle at the best price. These are some of the recommended surf shops in Dubai for surfers. If you want to share your experience or recommending a surfing shop, please do so by adding comments below.